For kids who march to their own drummer — or are especially attached to a comfort object — here is a completely adorable character who wears his singularity in style. Jameson only ever wears green pants. When he wears green pants, he can do anything. But if he wants to be in his cousin’s wedding, he’s going to have to wear a tuxedo, and that means black pants. It’s an impossible decision: Jameson would love nothing more than to be in his cousin's wedding, but how can he not wear green pants? Will Jameson turn down this big honor, or will he find a way to make everyone happy, including himself? In this pitch-perfect ode to individualism, acclaimed author-illustrator Kenneth Kraegel creates a character readers of all ages can root for — whatever color pants they wear. Kenneth Kraegel is the author-illustrator of the picture books The Song of Delphine and King Arthur’s Very Great Grandson, which was a New York Times Notable Book and a Wall Street Journal Best Book of the Year. He lives in Grand Rapids, Michigan. Kraegel (“King Arthur’s Very Great Grandson”) again spins a heartwarming tale attuned to the emotional highs and lows of childhood and the amazing elasticity of family love. His watercolor and charcoal art is as warm and witty as the story itself. Kraegel's text displays deep respect for both children's quirks and their right to those quirks, Jameson's mother over and over reinforcing for him that the decision (be in the wedding with black pants or in the congregation with green ones) is his. This quirky kid and his loving family will instantly endear themselves to readers. 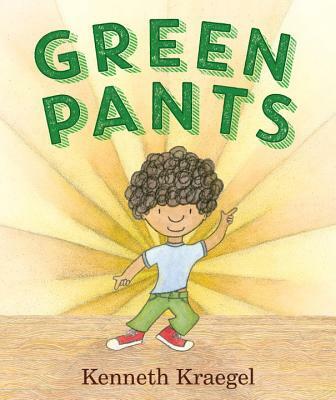 This is a delightful book for all children who love to express themselves and for those who want to be who they are...The illustrations of Jameson are superb at depicting what the character is feeling—from anxiety over making a difficult decision to the elation he feels when wearing his favorite pants. A fun read-aloud, perfect for storytimes, and a great addition to most collections. Kraegel’s watercolor-and- pencil illustrations make great work of Jameson’s poignant, meaningful facial expressions, which augment the joys and frustrations in the text. That Jameson is allowed to make his own decision is particularly empowering. Any kid with a favorite object will likely be charmed by Kraegel’s positive message here. The story and the art complement one another and the language is age appropriate. For any young reader who has had to make a choice regarding a favorite object or activity of any kind, this book will serve as a good starting point for discussion. This book could also be useful for conversations about character education and how to make good decisions. A solid, fun nod to the importance of being just who you are, "Green Pants" strikes this important chord in just the right way.